In line with its commitment to the health, safety, dignity and welfare of all workers, Expo 2020 Dubai recognised its delivery partners’ ongoing efforts to advance worker welfare at the first ever Better Together Awards, which were hosted in Dubai, UAE. 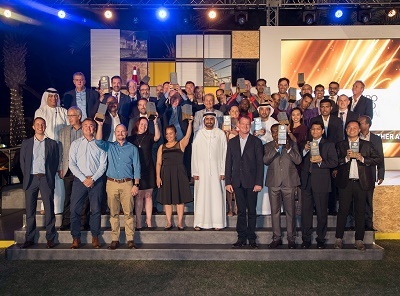 Designed to acknowledge world-class health, safety, quality and environment (HSQE) performance, the event saw 200 construction professionals gather at the Address Montgomerie to celebrate best practice among the contractors and consultants helping to deliver the Expo 2020 site. A total of 125 entries were submitted across 12 award categories, which recognised the initiatives, individuals and organisations that are helping Expo 2020 to raise the benchmark for HSQE and worker welfare in the Middle East, Africa and South Asia region. Awards were presented for the contractor and consultant of the year, as well as for initiatives that have driven HSQE progress. Trophies were also given to a variety of construction professionals, ranging from workers, supervisors and project managers, to the individual who has done most to positively impact worker welfare on the Expo 2020 site. Tony Aikenhead, Chief Infrastructure and Delivery Officer, Expo 2020 Dubai, said: “When it comes to delivery, Expo 2020 has four main objectives: to get everybody home safely every day; to treat people with dignity and respect; to preserve the environment and promote sustainable solutions; and to take pride in our work by striving for excellence and getting it right the first time. Representatives from Al-Futtaim Construction, Arabtec Construction, a CH2M-Mace joint venture, Laing O’Rourke, Parsons and Turner & Townsend all received accolades on the night, with UAE-headquartered Al Naboodah Construction winning the overall Better Together Award. During peak construction, approximately 40,000 workers are expected to be active on the Expo’s 4.38 sqkm site. Based on the core values of care, respect and pride, the Better Together Awards represent an important part of Expo 2020’s strategy to advance worker welfare standards for everyone involved in the delivery of the next World Expo, in collaboration with its partners and UAE federal entities.